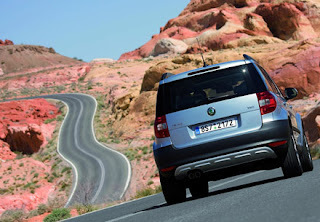 The Skoda Yeti will start from £13,750, rising to £22,120 for the flagship 2.0 TDi 4WD Elegance. The new crossover will be available in four trim levels with a choice of five engines and either two or four wheel drive. A dual-clutch DSG transmission will be available with the 1.2 TSI 105bhp petrol engine. Entry-level Yeti E gets air conditioning, remote central locking, 6 airbags, CD player, 16 inch alloy wheels and front electric windows. Mid spec Yeti S starts at £14,250 and adds front fog lights, rear electric windows and driver's knee airbag. The SE gets dual-zone air conditioning, cruise control, integrated touchscreen 6-CD player, rear parking sensors and 17" alloy wheels for £15,650. Range-topping Yeti Elegance starts at £17,600 and is available with a choice of five engines – including the 2.0 TDI common-rail 170bhp 4x4. Additional kit the over Yeti SE includes an off-road button with the 4x4 transmission, ESP, bi-xenon headlights with cornering function, full leather upholstery and rain-sensing windscreen wipers. Engines range from the 1.2 TSI with 105bhp to the 170bhp 2.0 TDI CR and the Yeti goes on sale from September.